Edwardian Promenade is a must read for all fans of the Edwardian era. Run by the lovely Evangeline, the website covers every aspect of life during this period, “with a bit of Gilded Age America, Belle Epoque France, and WWI thrown into the mix!” Evangeline lives with her “very possessive and territorial cat” in Northern California, where she writes historical romantic fiction with “strong and intelligent heroines grappling their personal relationships and the thornier issues of their time”. 1. If you could live in any era, what would it be and why? Tough one! Either the court of Versailles during the reign of the Sun King or 1930s Hollywood. The court of Versailles because I want to see its magnificence at the beginning and have a soft spot for Madame de Montespan. 1930s Hollywood because I am a classic cinema buff and I’d love to meet Jean Harlow (so pre-1937 ). 2. If you could invite three people, dead or alive, to dinner, who would you invite, and why? Alice Roosevelt Longworth, Ida B. Wells-Barnett, and Rosa Lewis–three strong, unforgettable, and independent women who left an inedible mark on society. 3. Three books everyone should read? 4. Who’s your style icon? 5. What are you watching on TV? Sleepy Hollow, Downton Abbey, Extant, Scandal, and lots of history documentaries. 6. What’s the soundtrack of your life? Christina Aguilera’s Stripped. I’ve loved this record for over a decade. 7. What’s your favourite holiday destination, and why? Washington D.C. – I’m a political history junkie and the Smithsonian was where I fell in love with history and science as a child. Food–as you can see with my recommendation of Julia Child’s cookbook. I read them for pleasure, whether they be modern or historical. 9. One thing on your bucket list? Extensive travel in the UK and Europe. 10. Something about you that would surprise us? I don’t know…lol. Maybe that I was a cheerleader in high school? I auditioned at the last minute in jeans and made the squad my freshman year. 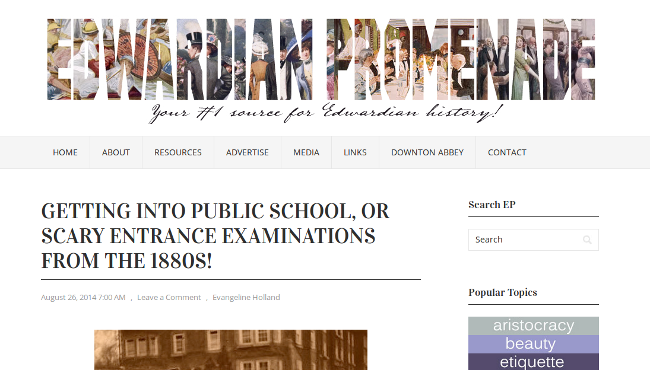 If you haven’t already done so, go check out Edwardian Promenade now. You can also keep up with Evangeline on Facebook and Twitter, and buy her books on Amazon.